Happy New Year, friends! I’m running super late on this as well as everything that’s sewing related at the moment. Life and school is keeping me incredibly busy and sewing time has taken the back seat for now. 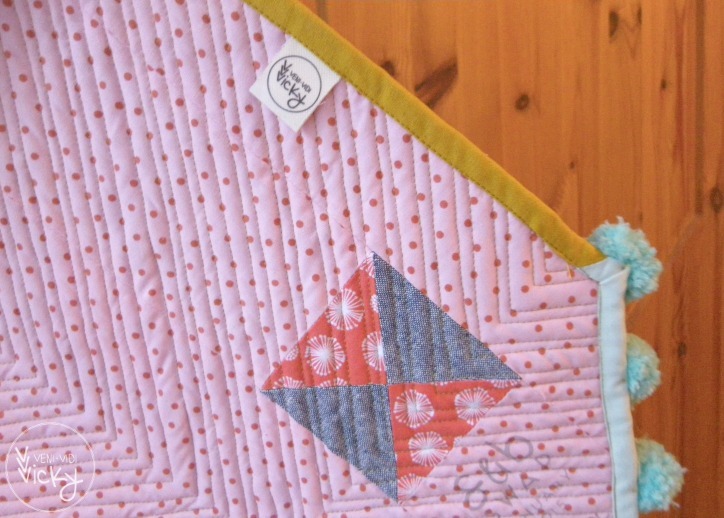 The mini quilt for the Schnitzel & Boo swap was due last week. I put this together in the late hours of a couple of evenings and it was an awesome way to wind down and close the day. I have never sewn something so twee and little as these two inch quarter square triangles. It’s not perfect but it came out quite similar to what I imagined. I made some slight changes to the finishing touches and added pom poms instead of tassels. I hope this will be a little more low maintanance for the lovely person receiving this. I’m in LOVE with the chambray mixed with the fresh, light colours, espescially the mustard. I think I will have to make another quilt using this fabric combo. For the backing I used a sweet IKEA rosali fabric and the one untrimmed block I had left from piecing the top. This was my original idea from a few months back, if you want to compare it with the final result. Tuesday at Blossom Heart Quilts. Der Mini ist total schön – und ich bin in die “Pon-Pons” verliebt! This is gorgeous Vicky. I really love how this turned out. I also absolutely adore the mustard solids. What a fun look! I’ve really enjoyed seeing your concept come alive. :) Were the pom-poms difficult to work with? ​Thank you Amanda! After I made a bulk of them I simply knotted the pom-poms onto the binding one by one using a dou​ble layerd piece of thread. This is brilliant! How did you fix the pom pons? Wish I was your swap partner! I just tied them onto the binding by hand using a piece of double layered thread. I had to make sure the neddle went right through the core of the pom-pom, so the whole thing wouldn’t slip off. But other than that, it was quite simple. Thank you for your lovely words, Nesta! 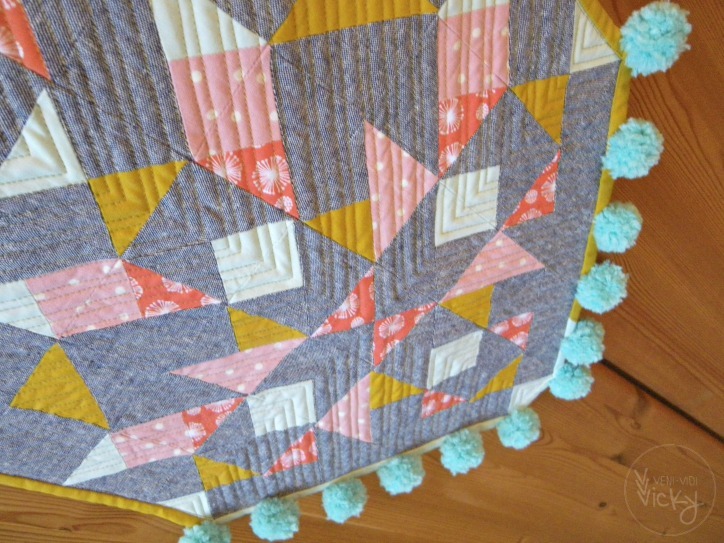 What a great idea to finish this quilted piece! Love it. Tatyana, thank you so much for your lovely words! So eine süße Umsetzung – ein Unikat! 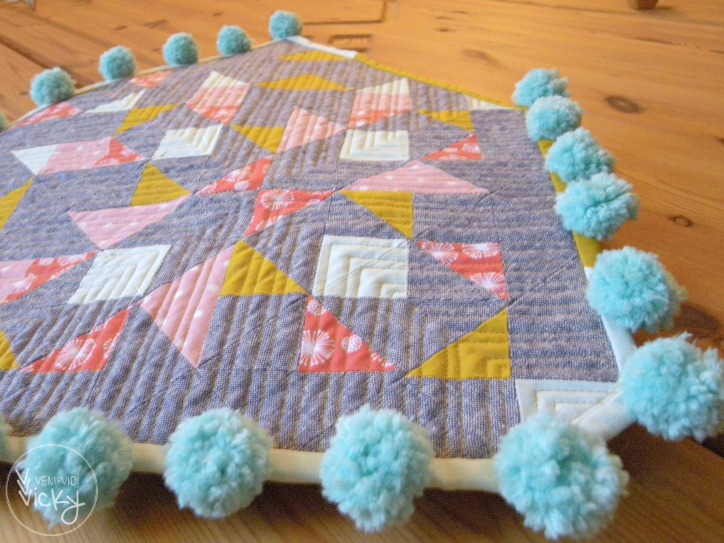 So nice to see this finished – I love what you have done, and the pom-poms were a great idea. What a fun mini! The pom-poms are unique and add a very fun touch. 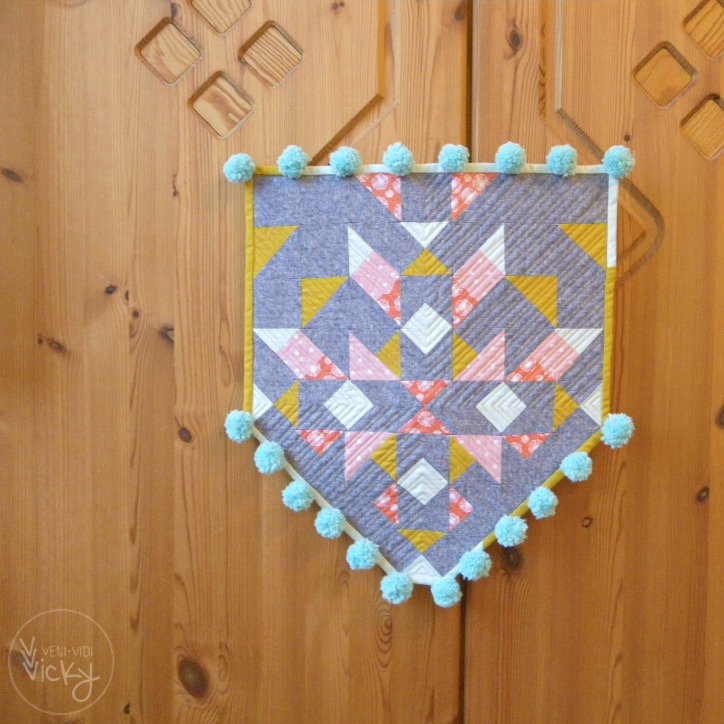 dieser mini Quilt ist (schon wieder) der Hammer! Ja, der graue Stoff und diese schönen leuchtenden Farben mit Senf passen fantastisch zusammen! und der Rand!!!! Jedes einzelne Pom-Pom Teil extra angenäht? ​Hallo liebe Kinga, danke für deine lieben Worte. Ich hoffe dann mal dass die neue Besitzerin die Farbkombi auch mag. Ja die Pompoms sind alle einzeln festegknotet. Man hätte es bestimmt auch “in Kette” befestigen können, aber so wars mir sicherer. This is awesome and the pom-poms just make it super special! Love your pom poms ! Your quilt is really lovely. Thank you! It’s the first time I tried something different for the binding finish and I’m glad it worked out like I imagined. It’s very twee – well done! PS. from where you get your labels? 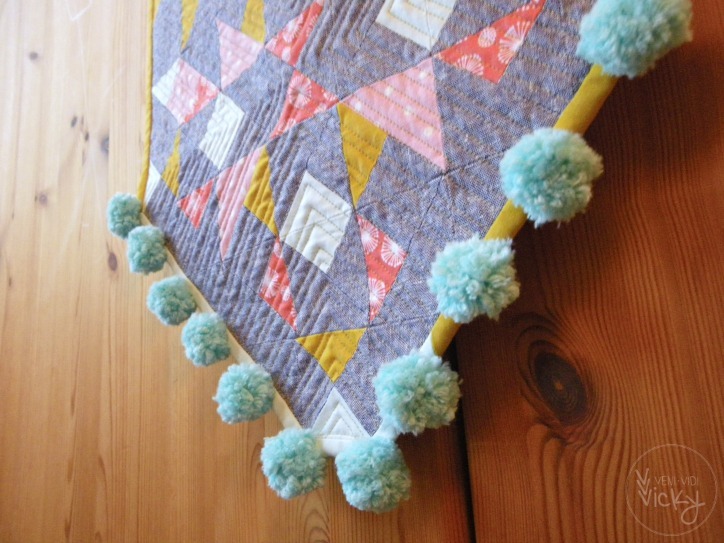 What a cool wall hanging, love the pom poms. I usually hate pom-poms but this has changed my mind on them quite a bit! Such a cute idea with the modern crest. I’m sure those bitty HST were a test of patience but they came out so wonderfully! !